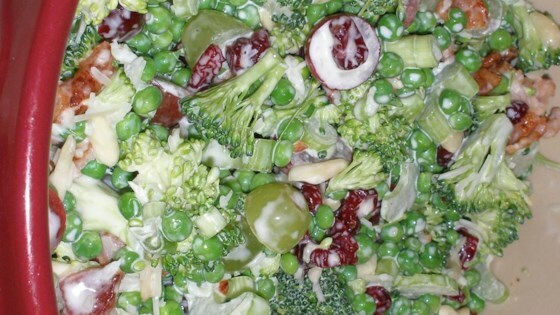 "Raw vegetable salad great for transporting and keeping cold!" Place bacon in a skillet over medium high-heat, and cook until evenly brown. Drain, crumble and set aside. This is a salad your guests will enjoy seeing just as much as eating. Very good recipe! I used sunflower seeds in place of almonds and all red grapes instead of red and green, let chill for a couple hours. Tasted great!